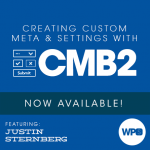 Justin Sternberg is an established “designeveloper”, a term he coined when he began transitioning from a designer to a… developer. He loves building custom hand-crafted solutions with WordPress. CPTs, custom taxonomies, and APIs FTW! He is one of the Developer Leads atWebDevStudios, and is having a blast!